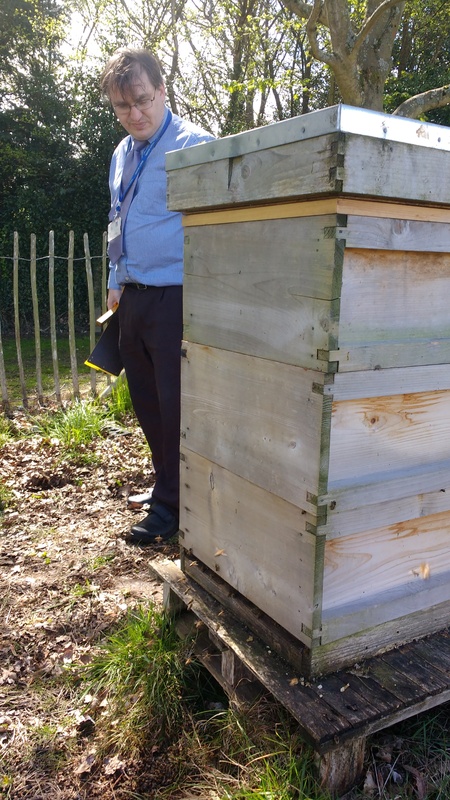 For many years now, my school has maintained three small colonies of bees, kept in an apiary within the orchards where the hive’s residents can collect pollen and nectar from the surrounding Hawthorn, Apple and Lime trees. Recently, I have been lucky enough to have been offered a chance to conduct a survey with these small creatures, by the leader of the hive, and a bee enthusiast, Dr Kevin Rogers. He is interested in where the bees he is taking care of collect their pollen from, and what kind of pollen they prefer to use. We plan to take a small sample of pollen from one of the hives in the apiary, once a week for the next few months. Once we have done this, we intend to identify the different pollens through a microscope and using a map of the surrounding area and its forage, to determine the preferred area that the bees like to gather from. 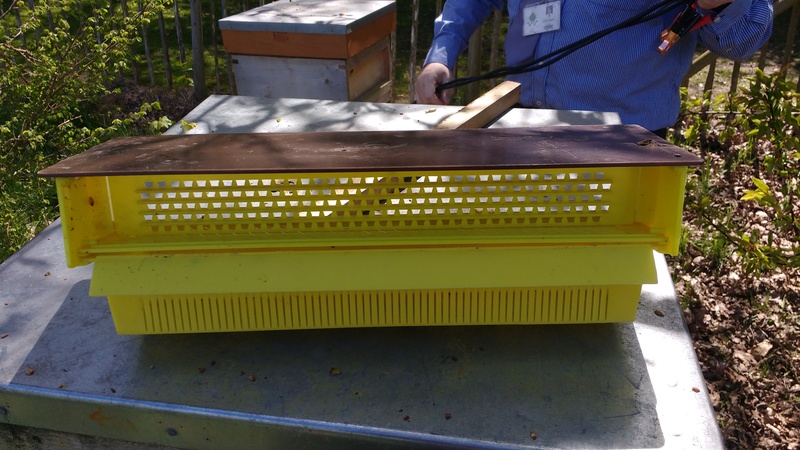 We’ll be collecting the pollen using this plastic pollen trap, pictured below, after we have made some slight alterations to the brood box entrance that force all of the bees to head through the collector. As the bees pass through the small holes, some of the pollen they are carrying scrapes off the pollen baskets on their legs, and falls into the box below, ready to be collected. We are using the most healthy colony for our survey, since they have producing a large surplus of pollen and won’t be affected by losing a small amount. These bees started out as Buckfast bees, a special hybrid species produced in Buckfast Abbey, which are prized for their low aggression, prolific egg laying and tendency to avoid swarming. However, these bees are now mongrels of Croydon, with no distinct pedigree species, combining the Buckfast genetics with those of bees from the area. One of the colony’s species is unknown, since they arrived as a swarm in the orchard surrounding the apiary, after their queen died in their previous hive. Once the alterations have been made, we can begin to collect the pollen, and I look forward to starting the project some time next week. Once every year, the Amateur Entomologist Society holds a large meeting at Kempton Racetrack, where enthusiasts and traders can come and show off their invertebrates and trade them. It is the largest event of its type in Britain, and several hundred entomologist turn up each year to attend. I go to this event most years, since I have a sizable interest in entomology (keeping a colony of white-spotted assassin bugs myself) and I enjoy wandering about the stands looking at the different exhibits. On the ground floor of the Kempton Racetrack building, there is a large trade centre, where breeders from across the country gather to display and sell the various invertebrates that they have in stock. Phasmids, cockroaches, mantis and any number of pinned butterflies. 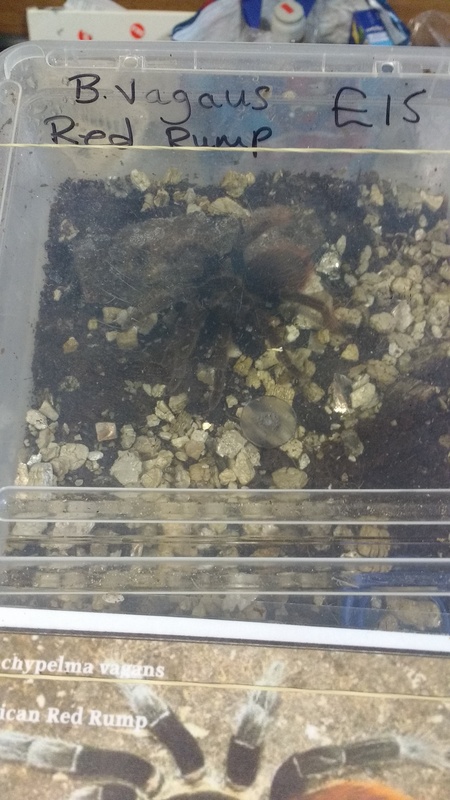 Tarantulas are a particular favourite, with a wide variety, including Red Rump, Salmon Pink, Ornamental Indian and Greenbottle Blue Tarantulas available as spiderlings, as well as many more. Tarantulas are incredibly large ambush spiders, meaning that rather than build elaborate webs to catch flying prey, like the garden spiders we are used to seeing, they prefer to lie in wait, watching for invertebrates and small mammals that stray to close them. People are often terrified of the Tarantula’s giant fangs, which can seem extremely intimidating. While there bite is painful, it is not fatal; the real threat that Tarantulas pose are in their bristles. These tiny barbed hairs can be released into the air, where they get into the eyes and nose and irritate the skin. On the floor above, while there are still many traders about, the various societies, such as the Phasmid Study Group, who deal in stick and leaf insects, and the Bug Club, for minors who are interested in the basics of entomology. 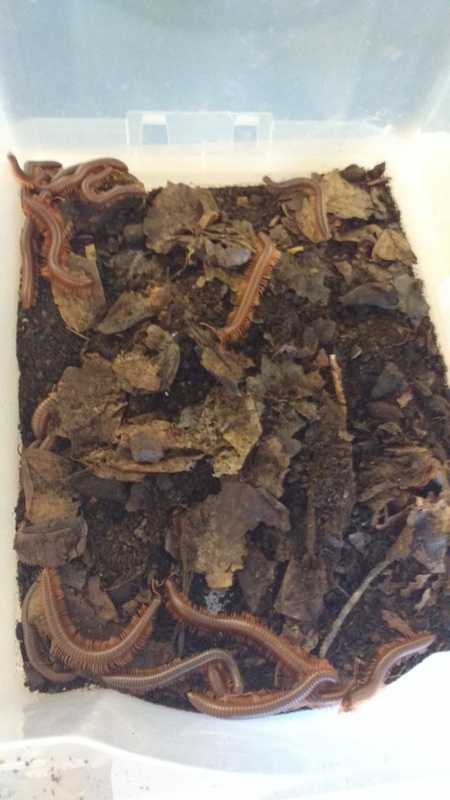 This year there was even a small unattended stand proclaiming the importance of earthworms on soil health, naming four separate kinds of worm and a largely inactive worm enclosure. Why a worm would need such a secure enclosure is beyond me, and there was no one around to ask. I saw a number of crabs, which while they are not actually to do with entomology are invertebrate, and therefore fair game. My father even decided to bring home three of those Hermit Crabs to keep in a tank. I shall see how they progress. Also attending the Exhibition, was Matt Smith, who took me on my work experience thrashing ponds and surveying reptiles a few months ago. As a professional entomologist and ecologist, he always attends the Trade Fair, and sometimes sells the extra beetle grubs from his vast collection of colourful invertebrates. I enjoy the AES Annual Exhibition greatly, and it is one of the highlights of my year. I hope to attend again next year, if my exam schedule permits me to. The people there are almost as interesting as the insects. 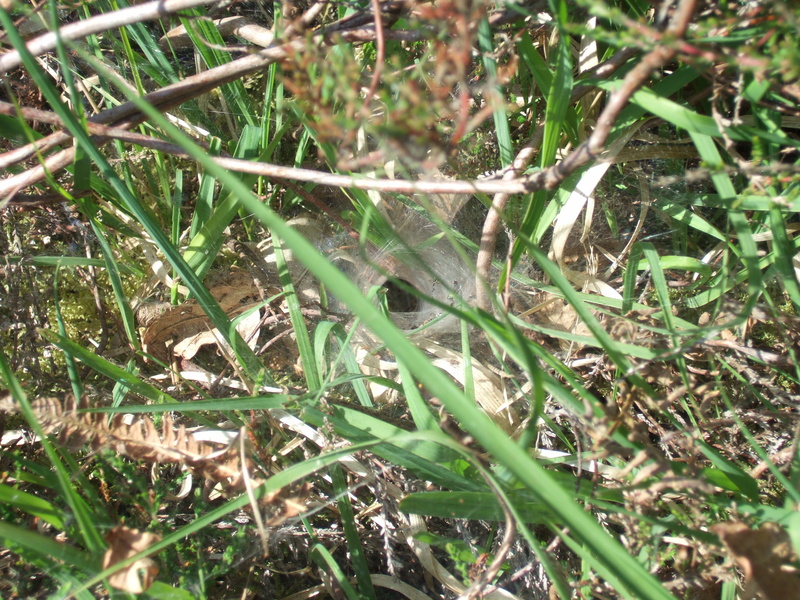 Dotted around Snelsmore Common you can find tubular spider webs, about 2cm in diameter, with wide sheets of spider silk around their entrance. This is not the home of the famous and feared Sydney Funnel-Web Spider, native to Australia, but the web of a Labyrinth Spider, that are common across Central Europe. The Labyrinth Spider, or Agelena Labyrinthica, is a species of funnel-web spider measuring at 10mm in males and 12mm in females with a broad beige cephalothorax, and a dark brown abdomen with a pale band down the middle. These spiders will wait for prey to stray to close to their maze-like webs and send vibrations through the air as they struggle in the silk threads, alerting the spider to the prey’s presence. The spiders can feel these air vibrations through the use of trichobothria, small hairs on their legs, which are shaken by even the tiniest air movement. They will then exit their web and drag the prey back into their den. Typically, they will feed on small insects, such as grasshoppers and lacewings, since these creatures live in the tall grass they make their webs in. These spiders lay roughly 100 eggs, which are stored in an eggsack at the perimeter of the web, disguised with grass and leaf cover. They young remain in the web through winter, until they are ready to leave. While the bites of Labyrinth Spider are harmless, their webs look very similar to those of the Cellar Spider, Segestria Florentina, who have a particularly painful bite. These spiders come to Britain on boats from Europe, and make their funnelled webs in cracks in buildings. To tell the difference, the Cellar Spider is black, with a distinctive green shine on the fangs, and will be living in urban, often costal areas. In addition, these spiders have five or six distinct lines leading from their homes, while the Labyrinth Spider has a single sheet. Try to avoid the Cellar Spiders, as their venom contains several painful neurotoxins. The Labyrinth Spider webs could be found all over Snelsmore, around shin level in the grassy heather, but Matt and I did not see any of the spiders themselves, since we did not have time to wait and watch the webs. While thrashing a gravel pit pond on my work experience with Matt, we found the nests of some solitary bees in the ground around the pond’s bank. Solitary bees do not live in colonies and hives like other bees, such as honeybees and bumblebees, instead living along and raising their young in a single nest. There are over 225 different species of solitary bee in the UK alone, making it almost impossible to identify these ones, especially without having seen the bees themselves. If I were to guess what kind of bees lived here, I would say, it was a Tawny Mining Bee or a Red Mason Bee, since they are both very common, and often borrow their nests in the ground. Solitary bees often pad their nests with leaves and moss on the inside to insulate their young, and create the chambers of their nests. 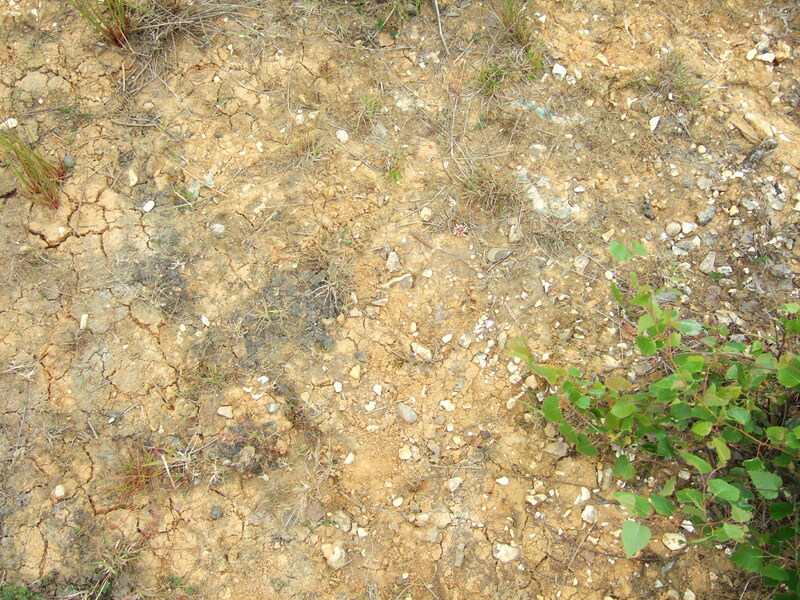 People can often mistake these nests for a colony, because many bees often live in the same area, since it is difficult to find an acceptable habitat, and this gives the impression that they are all living together in a single large hive. There are two main types of solitary bees, Miners and Leaf-Cutters. The miners, like the ones we found on the bank of the pond, will dig their nests in sandy or loose soil, stock up their nests with pollen and nectar to sustain the larvae, lay their young, and then seal the nests, leaving the babies to fend for themselves until they become adult bees, and dig out of the nests. Miner bees resemble honeybees closely, but you can tell the difference by looking for the pollen baskets on the back of the bee. The solitary miner bees lack these pollen baskets. Leaf-Cutter bees, will normally build their nests in dead plant matter such as stems or shallow roots, and cut out circular pieces of leaf and petal from nearby plants in order to construct their nests. Leaf-Cutter bees in particular are excellent pollinators, and are just as important to the pollination process and colonial bees. Unfortunately, it was too windy for the bees on the day we discovered the nests, and they would not leave to let us have a better look at them, although we know they are definitely miner bees. After thrashing the pond, we left the bees as they were. While thrashing a woodland pond for my work experience, I found several types of dragonfly larvae, including the larvae of the beautiful emperor dragonfly. In the pond Matt and I discovered three different species of dragonfly larvae, both hawkers and chasers. The hawker dragonfly on the right, can be recognised by it’s larvae’s larger, longer body, which will eventually turn into a dragonfly from one of the largest and fastest groups of dragonfly around. Hawkers generally fly well above head height, rarely settling, and diving down on prey like a hawk. They are the largest and fastest dragonfly, as well as the most prevalent type in Britain, with over seven species. I am not sure what species the larvae on the right is, but I suspect it is a Brown Dragonfly. The chaser dragon fly in the middle, has a smaller and squatter body than the hawker’s, and will turn into a Four-Spotted or Broad-Bodied Chaser when it matures. Chasers sit on vegetation around ponds and rivers, waiting for their prey to fly past them, before taking to the air to hunt them down, giving them the name chasers. The large dragonfly larvae on the left is that of an emperor dragonfly, which is extremely common in Britain, and can often be seen flitting around the edges of ponds, in Europe and parts of northern Africa. We can identify the larvae by the round shape of it’s head, as opposed to the more angular heads of the other larvae. It is also a hawker dragonfly, and has beautiful sky blue colourations when mature. They will prey mainly on butterflies, and other slow moving flying insects, which they dive down while they fly beneath them. They have been known to eat other species of dragonfly, particularly chasers and darters, which are slower and more vulnerable to their attacks. In the past, these dragonflies have been associated with witches and the devil, people claiming that they use their tails to sew up peoples eyes in the night. Obviously such tales are untrue and completely unfounded. The emperor dragonfly larvae pictured above is close to becoming a full adult, and will likely transform within a week, so we let him back into the water, keeping the other two larvae for identification under a microscope. 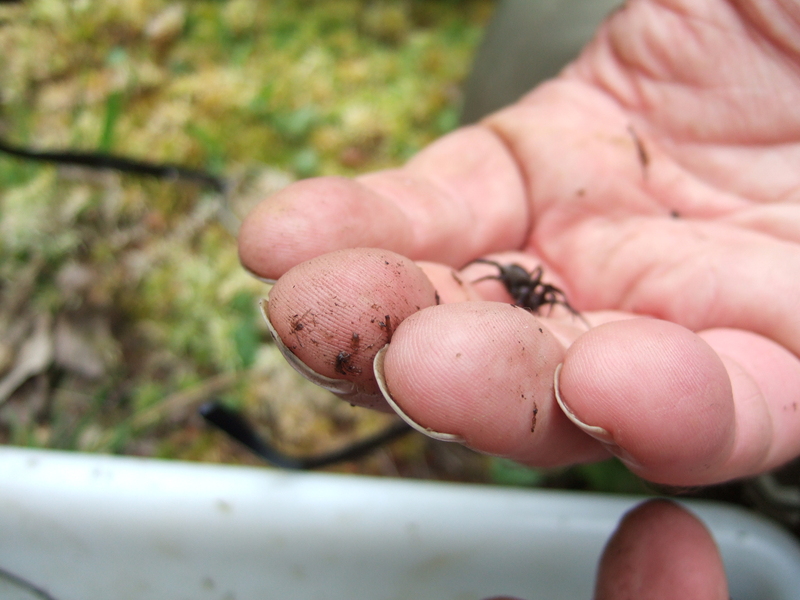 While thrashing in a woodland pond on my work experience, one of my thrashings brought up an adult diving bell spider. These peculiar spiders live among reeds and weeds in ponds from Asia to Europe, including British ponds. They are the only type of spider to live their entire life under the water, in little web ‘diving bells’ containing air. In well oxygenated water, new oxygen will diffuse down the concentration gradient into the diving bell, removing the need for the spider to ever return to the surface to collect more oxygen. This means the spider will hunt and mate within the safety of these bells, without ever having to leave. 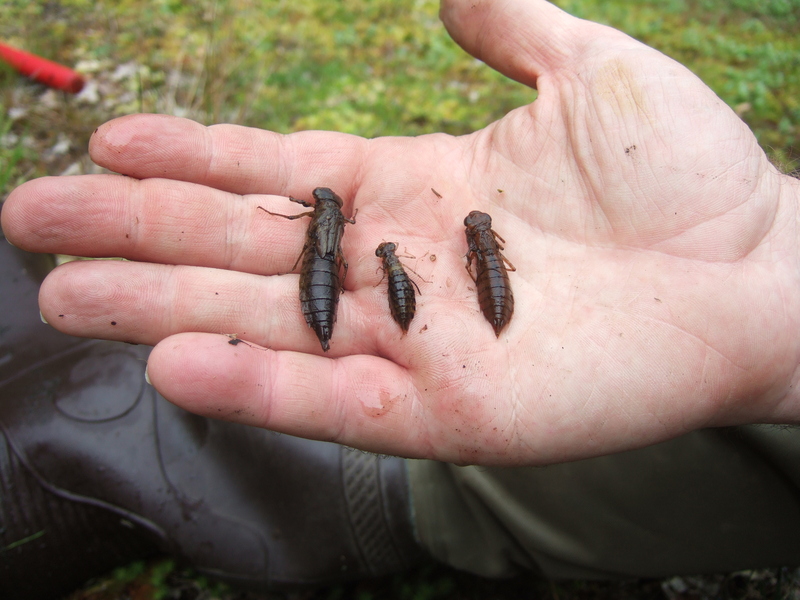 They hunt mainly small invertebrates and crustaceans, such as nymphs and fresh water shrimp, which they dart out of their bells to catch. This particular spider is a female, which can be seen by her small size and dark colouration. Unusually for spiders, the female is much smaller than the male, who has a far more active life of hunting then the female. A male also has much lighter yellowish colours and creates far smaller bells to live in. When the spiders want to mate, the male will build a new bell near the female’s bell, and will then weave a tunnel through into the female’s area, where they will mate. Typically 40 – 50 eggs are lain, and will hatch into baby diving bell spiders, most of which will be eaten by frogs and fish. Rather than release this spider back into the pond, Matt took it with him, since a friend of his had been looking to keep one. They are fairly challenging to keep, requiring live prey, large spaces, and well oxygenated water. These are not recommended for beginner keepers.